Game of Thrones meets the Grimm’s fairy tales in this twisted, fast-paced romantic fantasy-adventure about Sleeping Beauty’s daughter, a warrior princess who must fight to reclaim her throne. Alright, alright. Game of Thrones meets the Grimm’s fairy tales? Let’s simmer down. There was nothing Game of Thrones-y about it, except for the fact that there was royalty. Grimm’s? Yes. In fact, I would say it was kind of like Shrek meets Mulan. Let’s carry on. I am always a little bit leery of gift given heroines. I’m personally a fan of a heroine who has to work for her success. When I read in the summary that Aurora had fairy gifts, I groaned inwardly. However, they turned out to be more like curses, save for the strength. I appreciated this. Kept in a dungeon by the ogre queen, Aurora’s mother, Sleeping Beauty, committed suicide in captivity to pass on her fairy gifts to her briar-born daughter, Aurora. Aurora and Jor, her little brother, then slipped out of the dungeon with the help of a guard. The story then flashes forward. The Ogre Queen has the prince in her clutches, but needs Aurora to fulfill a dark prophecy. Aurora dresses like a boy to pass as a soldier. When Prince Niklaas saves her from a bunch of headhunters, she introduces herself as Prince Jor (her brother’s name), but says she would rather be called Ror. At this point, I was convinced Prince Niklaas was an imbecile. AuRORa? Come on, man! The worldbuilding was fabulous. The story was intricately woven, and it really did feel like a tale from Grimm’s fairy tales. I loved Jay’s writing style, too. The romance was subtle, which worked well for the characters and story. All that aside—I wasn’t wowed by this story. I wasn’t pulled in and held there, turning page after page until I finished. It was a great read, which I appreciated, but it just didn’t captivate me as much as I had hoped. I’m not quite sure what was so “meh” to me. I think this book would really captivate most fantasy fans, but it just didn’t do it for me. 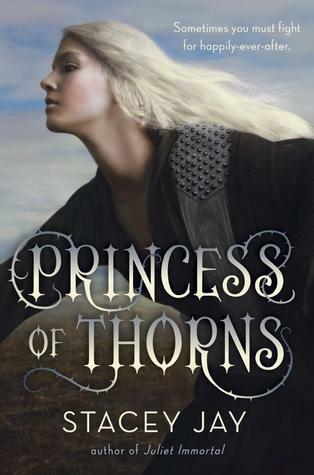 I gave Princess of Thorns a 3.5/5 on Goodreads.